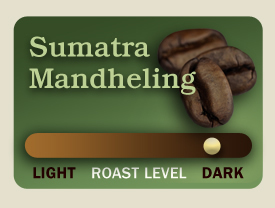 Sumatran coffees are hand sorted, and come in single-picked, double- picked, and even triple-picked lots. Since Sumatran’s are dry processed and often laid out to dry on the dirt in small villages, sorting the coffee is essential to take out the sticks and stones that the beans inevitably acquire, but triple picking does not necessarily improve the quality of cup. In fact, we sometimes find that over-picked beautiful polished coffees are sometimes bland in the cup.